Here we are again! I hope your day has been great, and happy! I love this time when we get together to share food. I especially enjoy sharing family favorites with you. It is hard to not share them all at once, and spread them out. 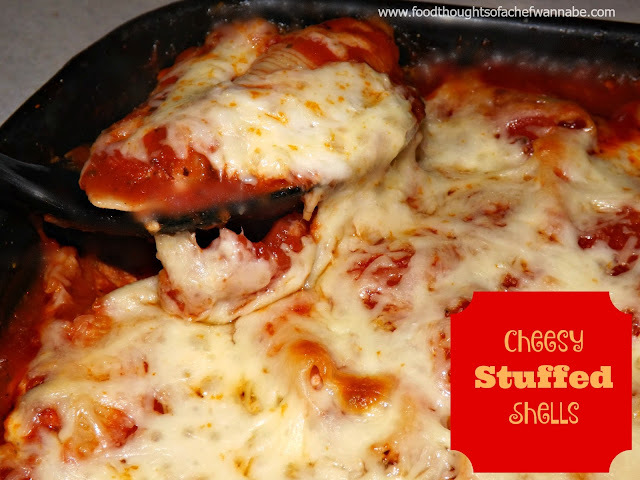 This is one I have never shared, and it is just your everyday run of the mill stuffed shells. My family loves them and this is what I would consider a quick weeknight meal. If you are a meal planner/prepper, have your sauce made, shells boiled and all of your grated cheeses put together in one large resealable bag. When the night comes you want to make it, it is not much more than just assembly. This makes about 20 shells. You can only cook that many or cook them all and eat the leftovers with butter and salt and pepper! That is what my husband lives for when I make extra pasta. You will notice I use what some of you may consider a lot of salt. I don't find that the saltiness of Parmesan cheese hits the same notes as actual salt seasoning in a dish. I find ricotta needs plenty of seasoning and that is just what I do. When you divide that salt out among a large casserole, I think you will live. If you want to omit it, please do, or cut it back, please do that as well. You have to adjust things to what is good for your family. I won't mind, in fact, I will welcome it ! Lets get started on this basic stuffed shell recipe that your family will love! Oh wait! You can also shred some provolone to use in this. I saw some of those cheese blends at the store include a provolone/mozzarella combination....um, YUM. OK, now we are ready. Preheat your oven to 350 degrees. Cook shells according to box direction, drain and run under cold water until they are completely cool. Let sit and drain while you mix up the cheese filling. In a bowl combine, ricotta cheese, shredded mozzarella, shredded Parmesan, Italian seasoning, onion powder, garlic powder, salt and pepper. Mix to combine. Use about 1/2 cup of your marinara (just plain) to dump in the bottom of the pan. Spread it around as it will keep the shells from sticking. Fill your shells with a teaspoon. This mixture will fill about 20 shells. You can cook the whole package or just the 20. Fill and place into the baking dish. Continue until your filling is gone. In the same bowl as the filling (hey I am not about using as many dishes as possible ya know?) Pour in the rest of the marinara and the diced tomatoes UN drained. Add in sugar and stir. Carefully pour over the shells as evenly as possible. Spread out the sauce with a spoon, and use the cheese you held back to sprinkle on top! Now, confession time.......... I used like, a lot more mozz. The photo below show only Parmesan but I decided I wanted more mozzarella on top!